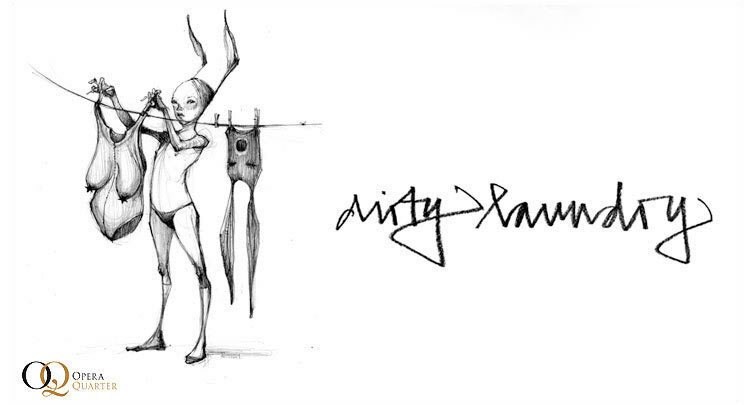 German collaborative duo Herakut will be opening a show entitled “Dirty Laundry” on November 28th. The show was organized by campobarbossa who arranged for a venue in London’s Covent Garden. All the works are pre-commissioned paintings and sketches so this will strictly be an exhibition with no sales. We quite like the combination of Akut’s photorealistic spray paint and Hera’s more fluid broad strokes.Â Jasmin aka Hera took some time to answer some questions and share some preview images with us. Arrested Motion (AM): Can you tell us a little about how you met and formed Herakut? 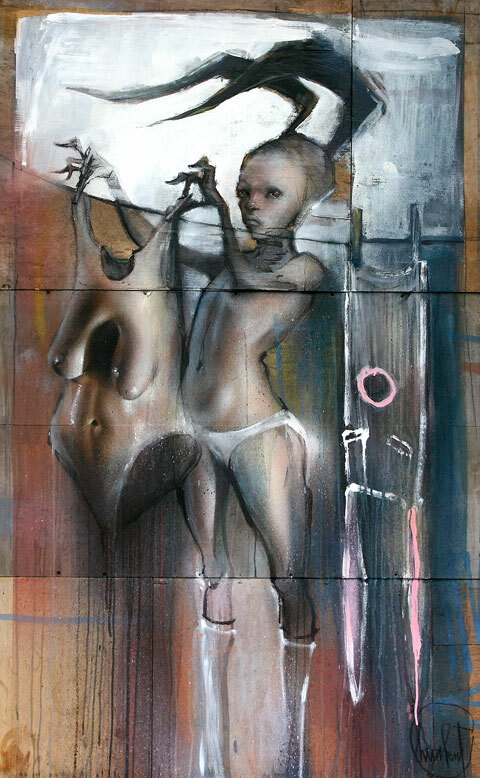 Hera from Herakut: Akut and I met at a classic graffiti festival in Spain in 2004 where we were both featured artists and shared a wall right away. We liked the outcome of the live painting session, liked the finished piece, but were even more excited about the way we functioned together. ThatÂ´s why we decided to continue painting with one another and started out with a couple of commissions. For years we’d do nothing but paint the walls outside, before we moved inside to paint on canvas. 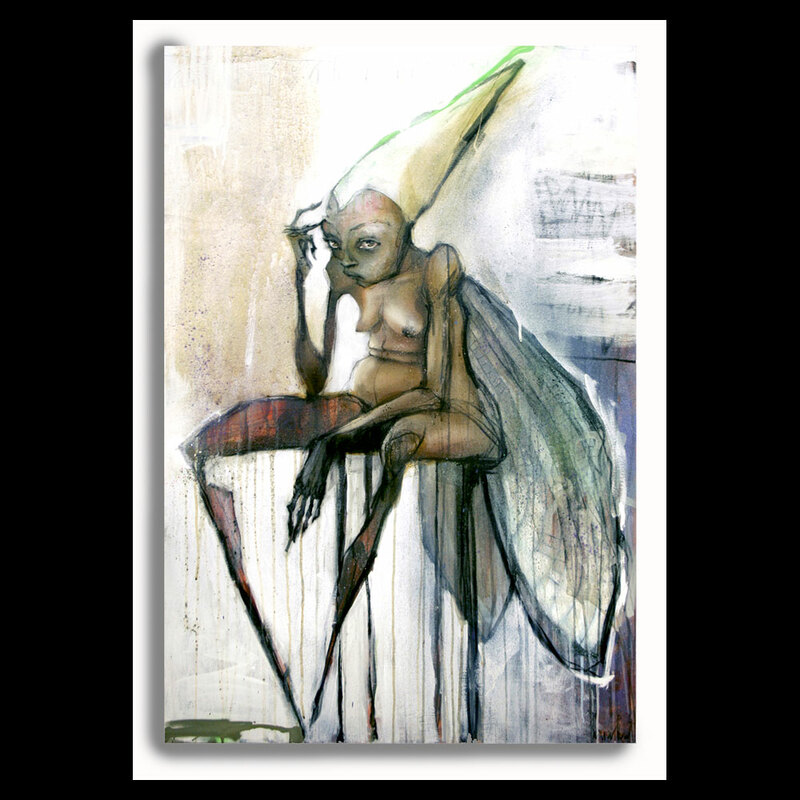 But right from the start we chose to merge our artists’ names into one: Hera and Akut became Herakut. 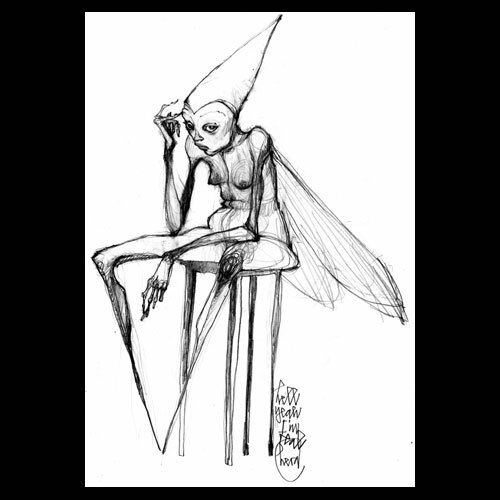 By doing so, we created a symbol for what we are and how we want to approach art – as an on-going dialog with at least two different views on a piece. AM: How is working as at team different than working alone and what is the process? Hera: Before you build a team you have to be “specialized” on your own distinct style and favorite technique. That’s essential before even starting a team work process. You already have to know what you are best at and know what you lack. That’s when it’s safe to work with someone else, otherwise you will always struggle with finding your own identity and won’t feel you are meeting on the same level. Luckily, Akut and I have never taken our own styles too serious, plus we have a good idea of what we are lacking as individuals. That’s why we are so appreciative of the other one’s input. Also, in a partnership like ours you really need to be able to let go of any expectations to the outcome of your work and just enjoy the process. What ever the piece turns out to be; we think of them as surprise gifts – and everybody loves gifts, right? AM: Is there a theme or message you are trying to get across to your audience with this show? Or is this body of work not related because they are all “commissions”? Hera: When you see our new pieces, you will notice a difference to our previous work. We have learned to allow an even closer inside look. It has become more personal, intimate even. The paintings are little windows to old experiences and how we have dealt with it. Somehow these thoughts appealed to people, and the sketched out ideas started speaking to people. So, it’s not only the dialog between us two anymore, it has become communication between two artists and a selected number of commissioners. Let’s see what they say about the finished piece. In the end, the title “Dirty Laundry” stands for all this “talk” we are doing about very private thoughts and information. AM: Can you tell us about some future projects or shows you are working on? Hera: There are two things we are really excited about apart from this show with Campbarbossa: one is the Herakut book that will be out next spring, and second is a live painting show in London scheduled for next March. Live painting in front of an audience is such a crazy experience. ItÂ´s good for people like us, who love surprises, because whatever happens behind your backs, whatever vibe the audience throws at you, it will reflect in the actual painting – will add to the conversation we are having on canvas cloth. AM: Thanks for your time Jasmin! Please stop by and check out their show. Pic of Herakut via evolvingstyles. Preview images via campobarbossa & juxtapoz. Categories: Art, Features, Interviews, Previews, Shows & Events, Street & Urban Art. Tags: Features, Herakut, Interviews, Shows & Events, Street & Urban Art.